The arrival of Spring and warmer weather already has me itching to put away my Winter wardrobe. Away with the heavy coats, thick sweaters, and multiple layers for warmth. I want to pull out the Spring clothes. I am ready for sun dresses and flats. Wearing dresses is so much easier when the warmer weather arrives. You don't have to throw on several layers over your dress and you don't have to freeze. In Spring I want dresses with florals, bright colors, and fun prints. I have my eye on several dresses, especially this one. 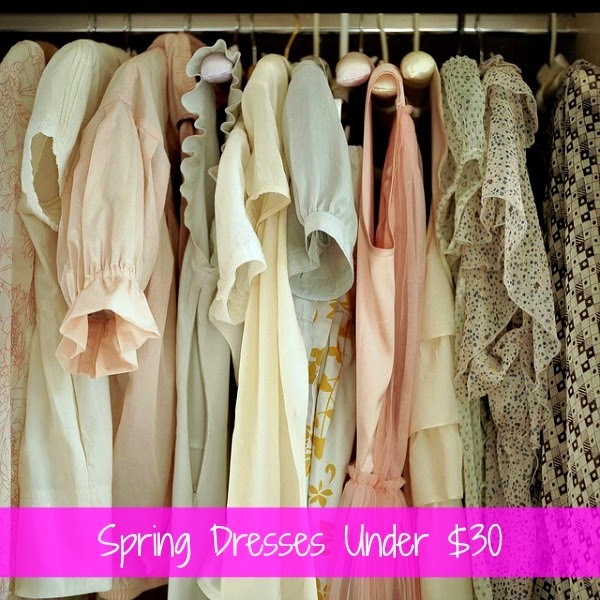 I am trying to do better about my spending which is why these #stylishforless dresses under $30 are perfect for Spring. What do you think? The first image is so pretty! Now that the sun is shining I'm in the mood for some spring shopping . Great ideas here and I especially like the floral dress. They're so pretty! I like what I see in the 1st photo, and then the one worth 27 dollars. I cannot wait to break out some of my printed dresses! I'm really liking the black bird dress! That bird dress is so cool, I love it! Love the top two options and the bottom row on the left as well. Wow!!!! Nice dresses!!!! Love them! These dresses are so pretty and definitely a steal! I also can't wait to start wearing more dresses once the weather finally warms up. When spring hits I definitely get the spring shopping bug- I want to buy up all the new pretty dresses + sandals! Great post, babe! I've been watching a lot of Mad Men lately and some of these look like they could be on there! LOVE it! Oh my goodness, I want to go buy that green dress right now! Oh man, I wish it would freakin hurry up get warm enough for me to justify buying any of these! cute!! I really want to wear dresses more this season!